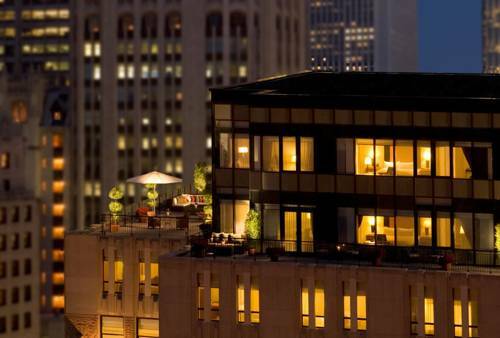 Slip effortlessly into the glamour of downtown Chicago in the 1930s at The Gwen, A Luxury Collection Hotel, Michigan Avenue Chicago. Inspired by the storied history of Chicagos grand hotels, The Gwen reemerges as an art deco haven wrapped in 21st Century amenities. Every detail has been attended to, from unrivaled dining to our in-room spa services, 24-hour valet and fully reimagined accommodations with enhanced amenities. Select our hotel's impeccable function rooms to host business meetings, galas and weddings, where our singular service is exemplified in our attention to detail and exquisite catering. Our historic hotel is perfectly placed near Michigan Avenue to give our guests instant access to Chicago's famous attractions, jazz clubs, theaters and, of course, shopping on the Magnificent Mile and North Bridge Mall. Home to an illustrious past and the inspiration for future travelers, our Illinois hotel invites guests to enjoy personalized service and luxury amenities for generations to come. Upstairs at The Gwen: Wind down at our rooftop restaurant for al fresco dining against the backdrop of Chicago s cityscape. Sip creative cocktails while sampling light fare surrounded by the enticing glow of our tabletop fire pits and panoramic views of the Magnificent Mile. Circa Restaurant and Lounge: Savor Midwestern cuisine in the sleek but welcoming setting of our hotel's restaurant. Enjoy a delectable prosciutto di Parma quiche for breakfast, or select roasted Salmon for lunch or dinner. Retire to the adjacent Circa Lounge for a perfect nightcap.